Summary: Minturn Outfitters is a Colorado-based outdoor apparel company. As part of this student project I designed an customer service portal for their e-commerce website. The goals of this design are to inform the customer of their order status and provide them with the means to contact the company if they need help. Role: UX/UI designer and researcher. Research began with a comparison of other online clothing retailers. Larger brands like Target and REI would have larger graphics highlighting a few sale rather than all of the products sold. Some common complaints of online shopping involve long shipping times and a general lack of information available to customers. The biggest insight I wanted to gain from research is what it took to get shoppers to commit to buying something online and what invoked the most confidence. A big takeaway from research is that shoppers feel the most confident buying clothes they have a lot of information available. This information could be in the form of reviews or product information the company provides on its website. Shoppers also draw confidence from past experiences where the company has taken care of them when a problem arose. With the insights from research, I wanted to design a tool for customers that would allow them to feel like they were communicating with the company and that they would be taken care of. 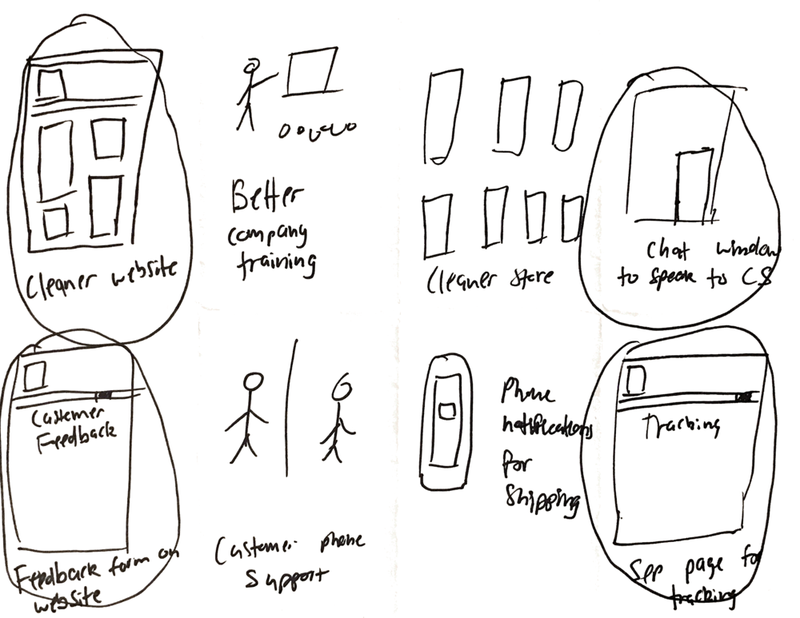 Generating design solutions with pen and paper helped me better understand the website's role in the challenge I faced. My goal was to create a modular design that would inform the customer of where, what, and when they could expect their package to be delivered. Users can find a separate feedback form from the order page so they can seek help if needed. Testers' expectations were met when they were tasked with getting more information about their order status, but they did not feel like leaving feedback would have much of an effect. Reordered the modules on the Orders page: Testers were confused by the layout of the pictures, wondering if the different positions meant something. There were also some instances in which they were expecting a text list. Back button to go back to "Orders" when viewing "More Details"
Giving users the tools to reach customer service is not good enough, there needs to be an assurance of action. Changes to the feedback form: one field to complete per page and a more conversational tone. Giving customers a way to voice their frustrations might be a promising way to inspire consumer confidence. Understanding what motivates consumers to purchase items online is a really powerful process even though there are a variety of users. Everyone has different preferences for seeking customer service/support. Most users went to the account page, but some expected a chat module for support. There is value in having multiple avenues for customers to reach customer service.